Having an innovative and functional workspace, multi connected, good lighting, ergonomic furniture, good air quality, recreational areas, etc., are useless if the employee is not happy and motivated. “The committed boss is the one who helps his colleagues, is empathetic and collaborates with his work colleagues; that is the true motivating leadership. The one who rolls up when difficult times come“. This was one of the ideas that Sebas Lorente, motivational lecturer and ex-champion of European wheelchair golf, threw to the auditorium of Workoplace Summit 2018 on Tuesday 20 in Barcelona. Sebas Lorente participated as an ambassador for The Mail Company, the Spanish company specialized in consulting and developing customized solutions in the fields of Digital Transformation and Internal and External Logistics. In his speech Sebas Lorente, in addition to defending a type of leadership “away from marketing and media focuses, more warm and direct and that is what really gets response from their collaborators“, defended concepts “such as education or kindness between colleagues, behaviors that many of us already consider inherent, but we still find unpleasant surprises among our colleagues or when we visit a company. And that affects trust between teams and productivity in professional environments“. In conclusion, Sebas Lorente pointed out that we should be “grateful for the time and place in which we live and work. Sometimes we should stop and think how lucky we are, even if we are in the middle of a traffic jam, and that would help us to relativize many aspects of our daily life both personally and professionally“. 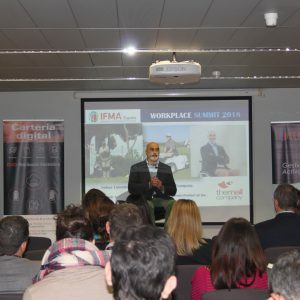 The Barcelona edition of the Workplace Summit 2018 was held at the facilities of the Simon company and was attended by more than 100 guests from profiles as diverse as the management of buildings, architecture and engineering, consulting, general services and the purchases All of them linked by the Facility Management, an activity that had a turnover in Spain last year of more than 60,000 million euros.